Advantech thinks that a prominent A+ enterprise should pursue the "Great" consistently, instead of being satisfied with just the "Good". We believe that everything should be done in the very best possible way. Not just looking at profit as the sole aim, but being a leader and inspiration in the domain. To become an A+ top corporation, we promise stockholders to consider sustainable operation as the goal, we promise employees to create a happy corporation that could enable a beautiful life for them, and we promise customers that Advantech will dedicate itself to becoming a model corporate citizen that actively promotes an altruistic spirit. 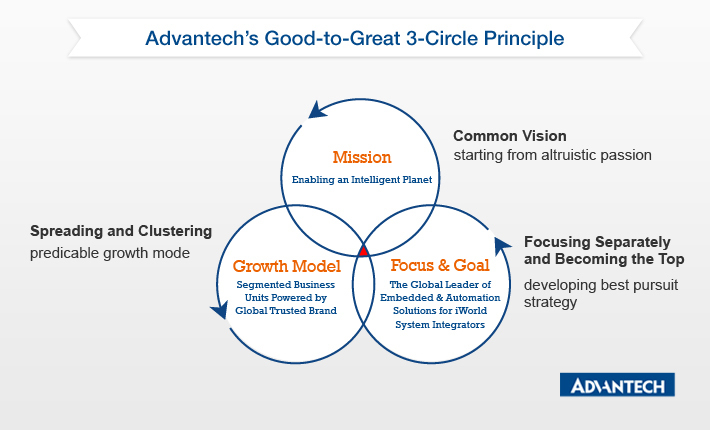 Advantech will promote its "Enabling an Intelligent Planet" vision and starting from altruism, focus on honest operation, seeking the best, sharing successful experiences and further developing the industrial cluster effect to establish a corporate growth model that will bring about a virtuous cycle of benefits to everyone, so achieving our aim of becoming the outstanding industrial leader thriving together with society.